I didn’t ever feel like a human, I always felt like a dog that was really out of place. I never really had a name for it, being a pup wasn’t a thing I knew about. When I met other people like me I felt I could be myself. 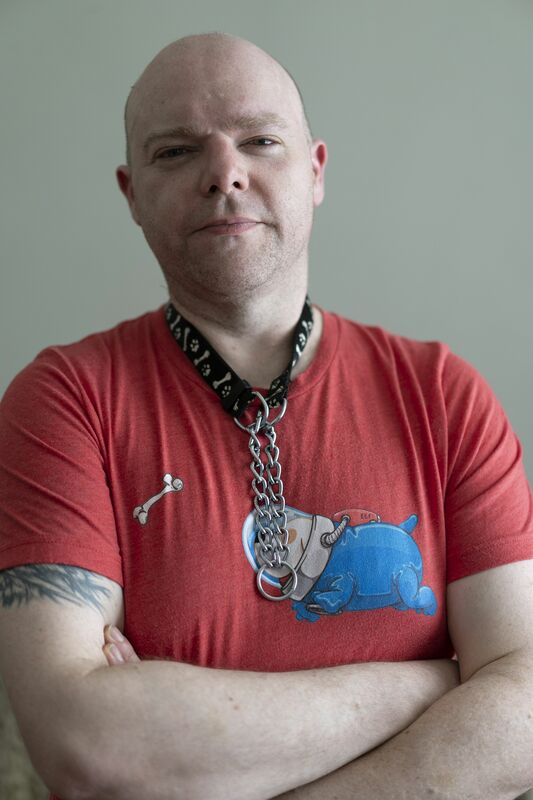 I was known by my friends for [saying] hello to them by grabbing hold of the collar of their shirt in my teeth and biting or licking them, very canine-type behaviours. It was always how I was. I realised that my behaviours were quite dog-like in childhood, probably from the age of six. No-one ever talked about it, it was never mentioned. My parents took early retirement and we moved to a farm in Norfolk. It wasn’t until the internet arrived in our house that I started chatting to people online – mostly through groups and message boards. I was incredibly nervous when I first started talking to people online. I was living with my parents and I would sneak downstairs at three in the morning to get on the internet to look for this stuff. I would hold a pillow over the 56k modem so you couldn’t hear the modem noise. I was worried that If I ever spoke to anyone about it, they would be like ‘you’re a nut job’. I feel a sense of peace being a human pup. Little things make me feel happy like eating my dinner out of a bowl using a knife and fork. I don’t eat at people’s tables when I go to friends’ houses. I can be a normal person in a restaurant, I’m trained and can deal with humans, but I don’t like it, it makes me feel uncomfortable. I don’t eat dog food, I eat regular food like a normal person but I do eat Bonios they’re quite nice. There are loads of dog treats you can get that are human friendly which are actually quite good for you.